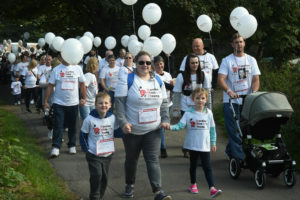 Next month [Saturday October 7th] will see charity supporters – many of whom will have been tragically affected by young sudden cardiac death in their family – take to the streets of Durham for the 8th annual CRY Durham Walk. Local CRY supporter, Steve Percival, has been one of the key organisers of the Durham Riverside Walk from the outset. He says: “The CRY Durham Walk really has gone from strength to strength over the past 8 years and I’m always pleased to do whatever I can to help grow this important and poignant event. Last year, for the first time ever, the Walk led participants through the City Centre, providing an even greater opportunity to raise awareness for CRY – and we’re pleased to be doing the same again in 2017. He adds: “I was invited to become involved with CRY by my good friend and local man, Jeff Morland – a loyal fundraiser and supporter of the charity for many years, following the tragic and sudden death of his son, Levon, from a condition known as Wolff-Parkinson White (WPW) in 2002. He was aged just 22. Every week in the UK, at least 12 young people (that is, aged 35 and under) die suddenly from a previously undiagnosed heart condition. In 80% of these cases, there will have been no warning signs or symptoms, which is why CRY believes that screening is so vitally important. Indeed, CRY’s pioneering screening programme now tests around 23,000 young people aged 14 -35 every year. The event begins at 11am, taking an 8km circular route, starting and finishing at Durham Amateur Rowing Club. The Walk includes magnificent views of the Wear Valley and Durham’s historic cathedral and castle. Please arrive at Durham Amateur Rowing Club, City Boathouse, Green Lane, Old Elvet, Durham DH1 3JU between 9.30am and 10am. Registration in advance costs £12 (£15 on the day) for adults but is free of charge for those who are accompanied and aged 16 and under.